Ukraïns’ki visti (New York) [«Українські вісті»; Ukrainian News]. A pro-Soviet newspaper that was published weekly in New York and allied with the League of American Ukrainians. In 1920 it succeeded Robitnyk (1914–20) as the organ of the Ukrainian Federation of the Communist Party of America, and it appeared daily until 1956 as Ukraïns’ki shchodenni visty. It reported on developments in the Soviet Union, the workers’ movement in the United States and elsewhere, and cultural and community affairs. In the interwar period it devoted particular attention to events in Galicia. In the late 1920s the paper became Stalinist and criticized the more nationalistic elements in the Communist Party of Western Ukraine led by Osyp Vasylkiv. After that time it rarely deviated from the official Soviet line, and constantly praised the Union of Soviet Socialist Republics and attacked Ukrainian ‘bourgeois nationalists’ in the West. It contained many reports of trips by Ukrainian Americans to Soviet Ukraine and literary contributions by Soviet Ukrainian writers. Editors and contributors included Mykhailo Tkach, Mykhailo Andriichuk, Mykola M. Tarnovsky, M. Kniazevych, and D. Borysko. From 1956 until the mid-1980s the editor was L. Tolopko; he was succeeded by M. Hanusiak. 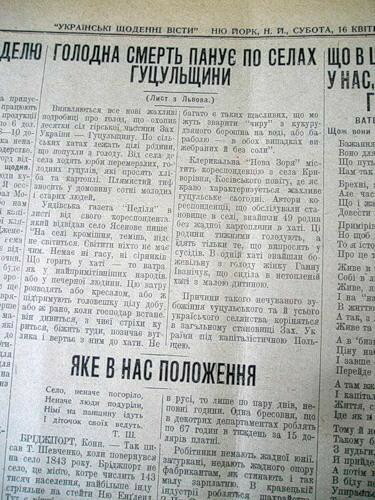 After 1977 Ukraïns’ki visti published a monthly English-language edition, the Ukrainian News, which succeeded the Ukrainian American (1965–77).